If you have a history of eating disorders like, for example anorexia, do not take L-Carnitine supplement because it can cause very low appetite side effects leading to a relapse in your condition. Do not exceed recommended dosage of the supplement around 500 mg three times daily to ward off L-Carnitine side effects like indigestion, diarrhea, vomiting and gas. If you have a history of seizures, avoid taking L-Carnitine supplement due to high likelihood of side effects. 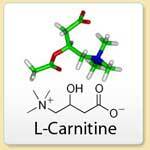 There have been reports of L-Carnitine side effects manifesting themselves in serious drug interactions with medications like Acenocoumarol (Sintrom) and Warfarin (Coumadin) and might cause dangerous bleeding problems. Discuss with your doctor whether Acetyl L-Carnitine benefits outweigh potential side effects in your health situation.